BAJA NEWS: Since 2007: How to Grow Veggies in the Desert? How to Grow Veggies in the Desert? Growing fresh, organic produce for your family in your backyard is one of the most rewarding aspects of gardening. It is also surprisingly easy — much simpler than you might think — in desert climates. In the little 4x8-ft plot my wife and I tend, we supply nearly all the produce for our small family from November to April. Below I discuss how to start your veggie garden, and a few strategies for dealing with desert conditions. It might seem counterintuitive where we have such a surfeit of sunshine, but even here, veggie gardens need pretty much all-day sun. A spot where the winter (southern) sun shines for at least 6 hours is good. A little late-afternoon shade (an eastern exposure) also works well, as long as the site gets the winter sun. Avoid planting a veggie garden under a tree or next to a tall evergreen hedge. The old adage says: “There is nothing you can do after you plant that improves your garden more than what you do before you plant.” It has to do with soil, and it’s absolutely true. My experience has taught me the easiest way to keep a garden productive and thriving is to make raised beds, fill them with good organic soil, and amend them regularly with compost. 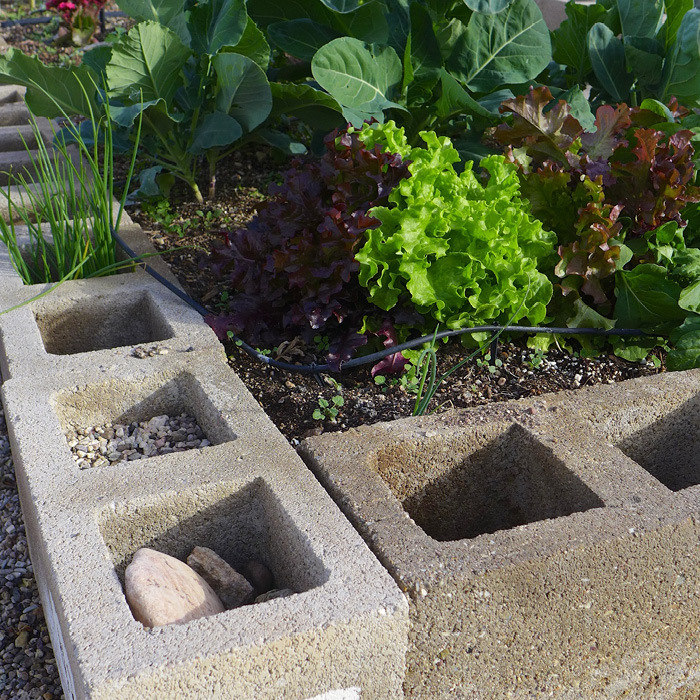 You can make the cheapest and most durable raised beds with concrete blocks, and you don’t have to be a mason to build one. The blocks are 8x8x16 inches, and you can dry-stack them rather than use mortar. Two courses make a nice 16-in-high bed. Typical bed sizes are 4x8 feet, as shown here. The fun part is choosing the plants, but in the desert our growing seasons are a little mixed up. We grow things all winter. In fact the cool months are my favorite gardening season, because growing is so easy. From October through early May you can grow myriad lettuces, kale, Swiss chard, broccoli, collard greens, mustard greens, bok choy, Brussels sprouts, and more. This photo shows cool-weather crops you can harvest over a long season. The cool season is an easier season to grow in for two main reasons: You don’t have to water as often, and most insect pests are dormant. As spring progresses, many of these cool-season plants go to seed and can be replaced by warm-season growers such as tomatoes and squash. In the desert, smaller tomato varieties tend to perform better than large, beefsteak types. When summer hits in earnest, shading your bed — as shown below — keeps your tomatoes producing longer. Discover more tips for growing your vegetable garden here. BAJA GOOD LIFE CLUB Join the Baja Good Life Club today and SAVE big on Baja! Get Mexican Auto Insurance for for as low as 127.00 / year. 686-230-9933 * bajagoodlifeclub@gmail.com * www.bajagoodlifeclub.com/join-us.